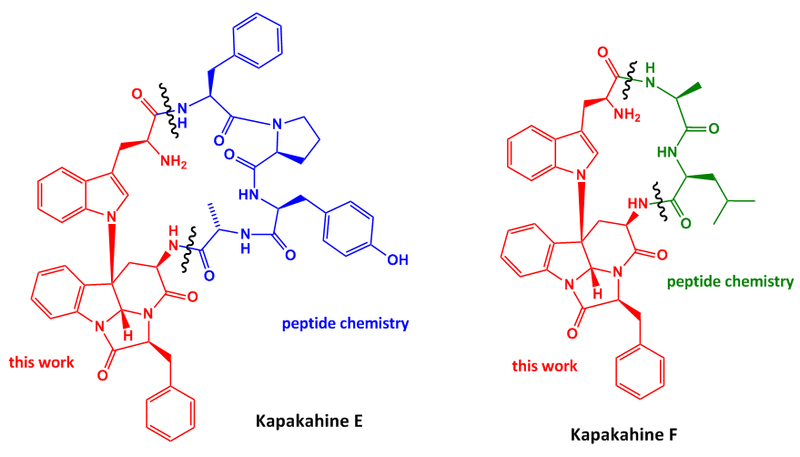 From a biological perspective the Kapakahine family members show some potent cytotoxicity against murine leukaemia cells with an in vitro IC50 value of about 5µg/ml. Only one synthesis has been published to date so a second approach might have some potential with regard to analogue synthesis or further biological evaluation. 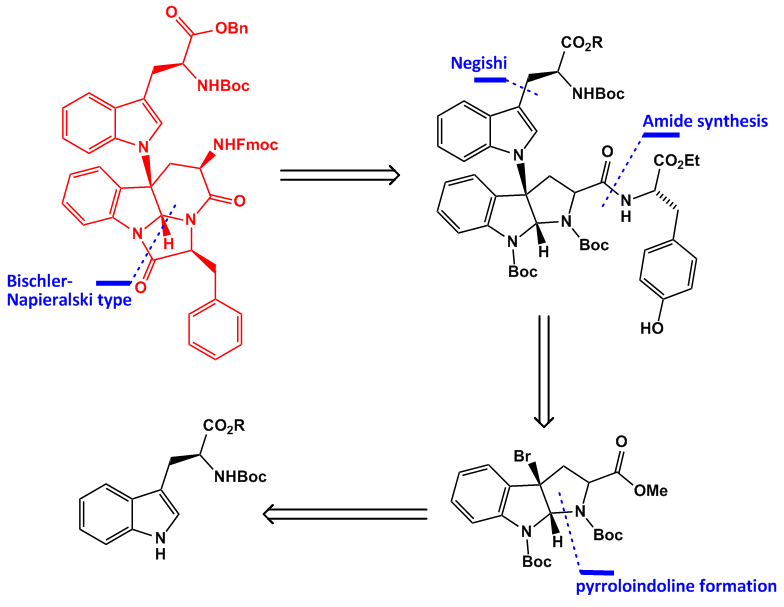 NBS mediated bromination leads to the formation of the bromo pyrroloindole in high yield but with the wrong configuration of the ester group. 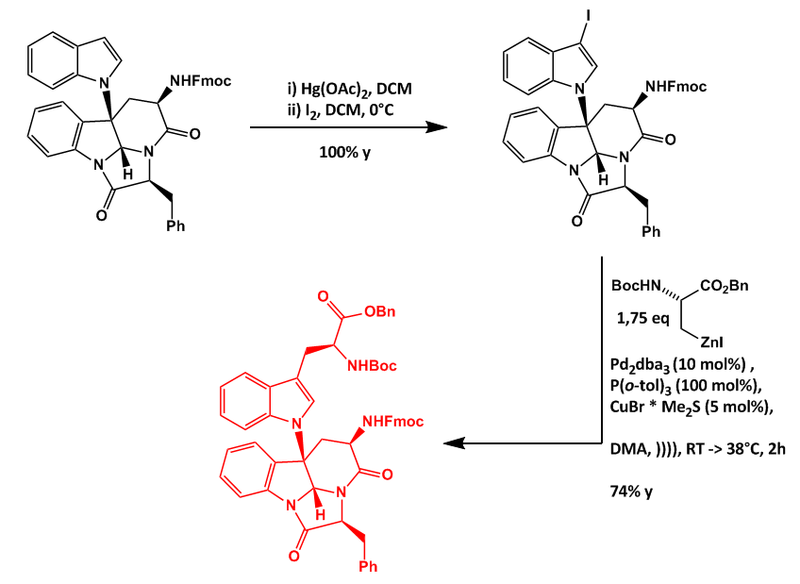 Nevertheless the bromine was displaced by indole under conditions developed earlier by the same group (http://pubs.acs.org/doi/pdf/10.1021/ja8061908), during which some racemisation occurred. The stereochemistry was then corrected under kinetic deprotonation/reprotonation conditions followed by amide formation with phenylalanine. 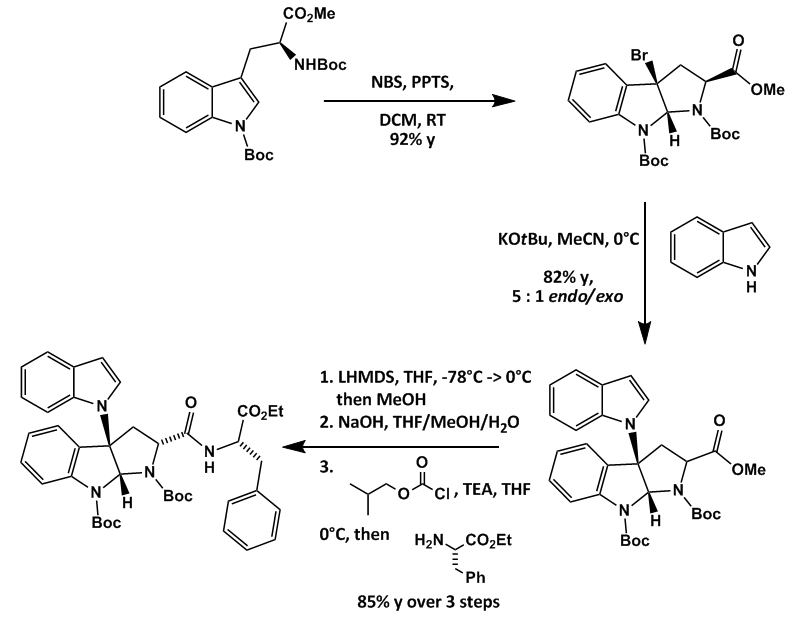 Global Boc-deprotection and phenylsulfination was followed by a nice AlMe3 mediated ring opening/double ring closing cascade during which dephenylsulfination occurred. The conditions were analogous to this work. 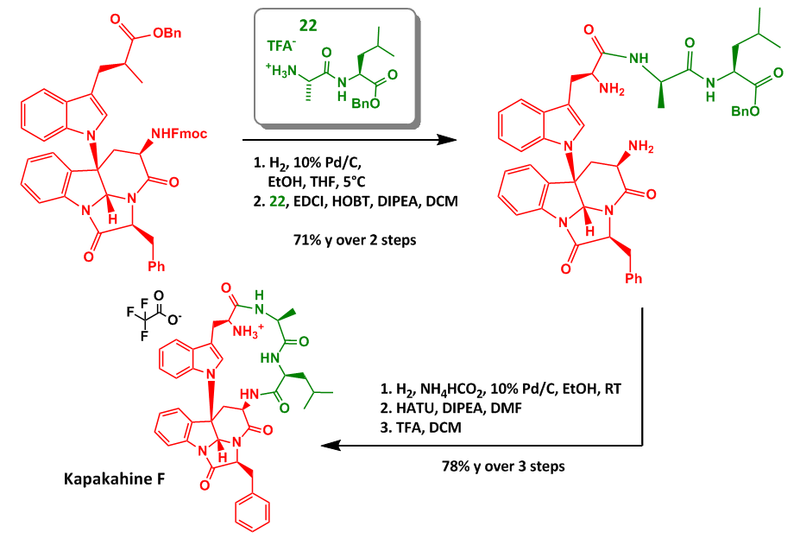 Reductive amination and Fmoc formation completes the scheme. Iodination of the naked indole was accomplished with mercury(II)acetate followed by iodine. The resulting iodoindole was then coupled under modified Negishi conditions with the protected shown zinc-alanine in high yield. Interestingly they needed a stochiometric amount of the ligand and some copper-DMS complex to speed up the reaction rate. The red fragment was debenzylated and coupled with the dipeptide protected as the benzylester. 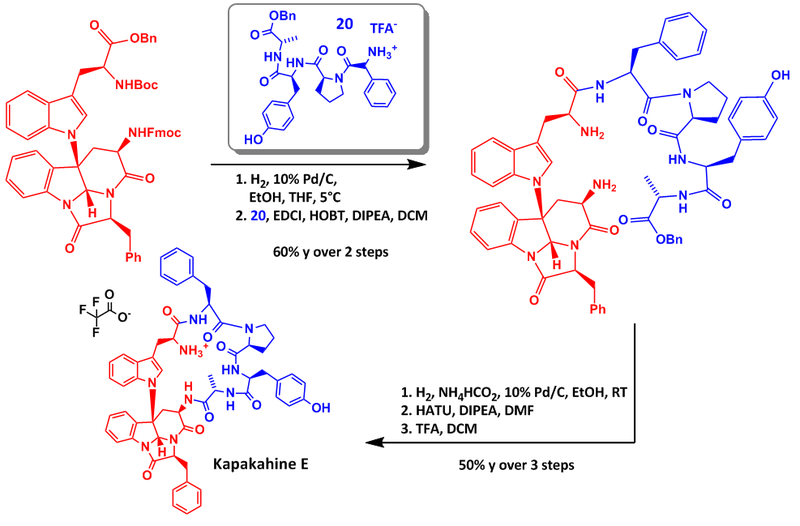 Again debenzylation and ntramolecular lactamisation gave Kapakahine F which was isolated as the triflic acid salt. 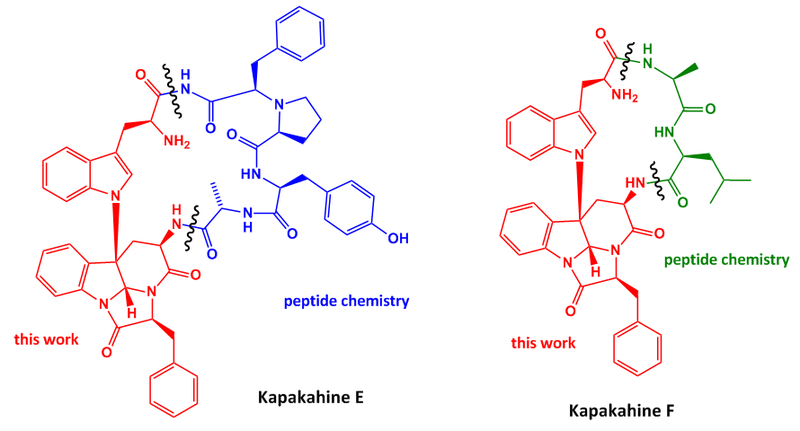 Kapakahine E was synthesized under the same conditions as utilized for Kapakahine F albeit in lower yield giving this impressive looking molecule. 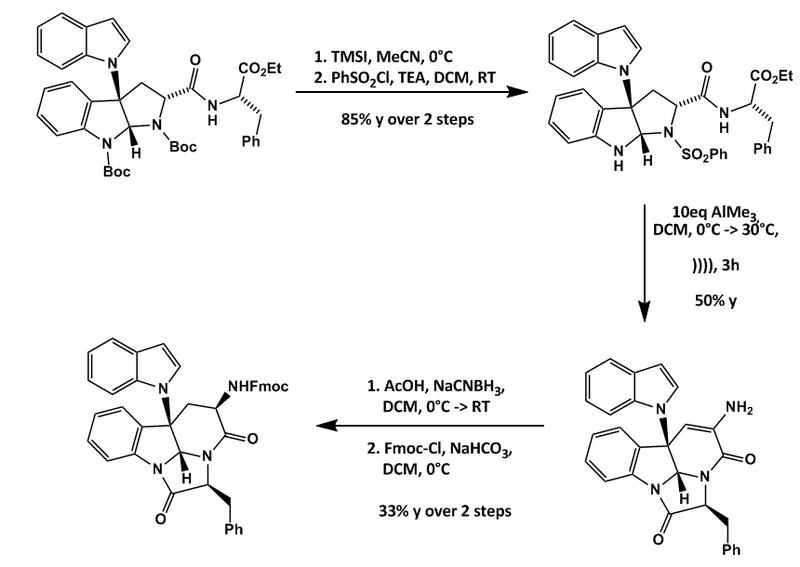 Nice chemistry; especially the Lewis acid mediated ring closing and the Negishi cross coupling.